Mike Place was frustrated and he showed it, according to The Washington Post. This was April 1996 and the reliever was playing for high-A Prince William. He'd also seen his lead erased by a passed ball, reacting by kicking the dirt, The Post wrote. Place's team went on to retake the lead and Place got the win. It was one of eight relief wins Place picked up that year. If Place's frustrations were evident that night, they might have also been for where he was at. Place had just started his seventh professional season. He'd yet to make AA. Place went on to make AA later that year, but he never made it higher. It was his final season as a pro. Place's career began in 1990, taken by the Braves in the 26th round of the draft out of St. Petersburg College in Florida. He was also credited by his formal name Michael Place. Place played in the Florida Little Major League youth tournament in 1983, throwing a one-hitter and striking out 14 in a July game. With the Braves in 1990, Place started at rookie Pulaski. He had a 2.61 ERA in 22 outings. He returned to Pulaski for 1990, also getting time at rookie Idaho Falls. In 17 outings that year, he had a 4.17 ERA. Place made single-A Macon for 1992, his first of four seasons at either single-A or high-A. 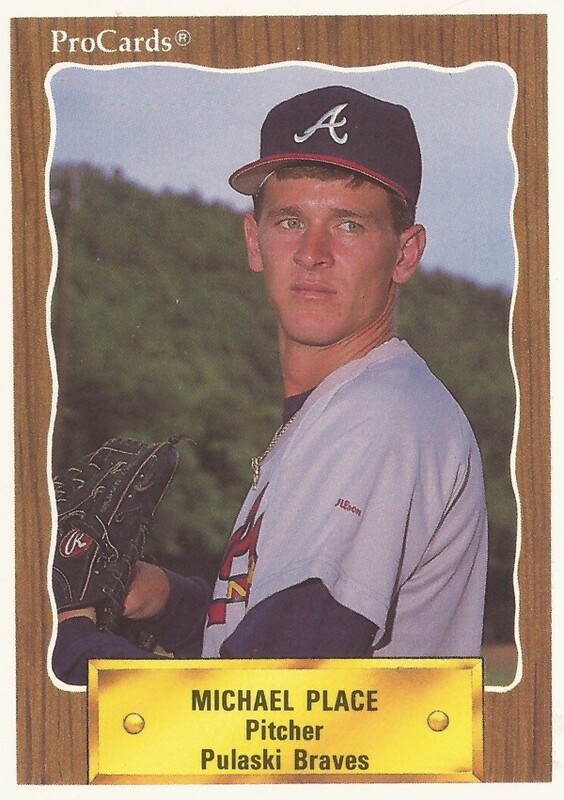 His best ERA of those years came in 1993, with a 2.54 mark between Macon and high-A Durham. He went 7-7 over 36 outings, 14 starts. His final full year with the Braves came in 1994. He then moved to the White Sox mid-1995, after starting the year back at Durham. He played out the season at single-A South Bend. Place then played his 1996 season between Prince William and AA Birmingham. He pitched two shutout innings in a May game for Prince William. Over 23 games there, he had a 2.31 ERA. At Birmingham, he got into 22 games and had a 7.09 ERA. It was his final season as a pro.